TALLHASSEE -- The head of a Florida insurance trade organization is cautiously optimistic that 2019 might be the year state lawmakers reform of “assignment of benefits," abuse of which critics have blamed for a dramatic increase in property insurance rates in the Sunshine State in recent years. "It's impossible to say with any certainty how this reform will move through session, but we're encouraged by the energy and support we're seeing this year," Florida Association of Insurance Agents President and CEO Jeff Grady told the Florida Record. "A number of legislators and state leaders have been outspoken about AOB reform this session and we're hopeful that, together, we can make it happen during this legislative session." 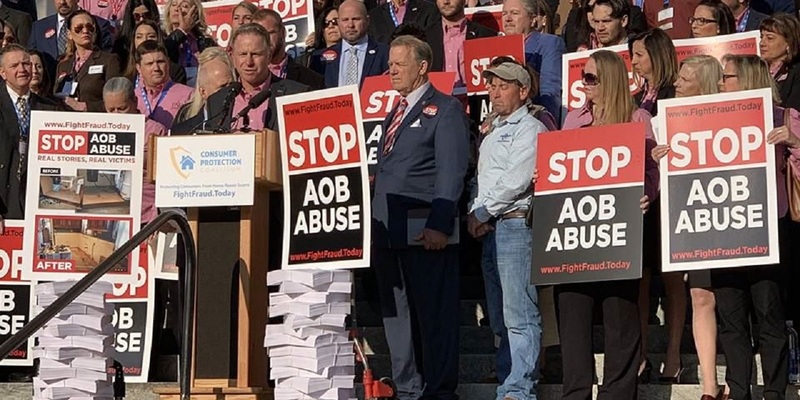 Last week about 125 proponents of AOB reform, backed by the Florida Chamber of Commerce, delivered 10,000 signed petitions to lawmakers, demanding action. The march came a few weeks after one piece of reform legislation, Senate Bill 122, was temporarily postponed in the Senate Banking and Insurance Committee. SB 122 since has passed the Banking and Insurance Committee and has been assigned to the judiciary panel. FAIA is a nonprofit state trade association of insurance agencies affiliated with the Independent Insurance Agents and Brokers of America. FIAI has 18 local boards in Florida and serves as an information source for nearly 2,000 independent property and casualty agencies who employ almost 25,000 licensees, according to information on FAIA's website. There's nothing illegal or especially new about AOB. Anyone in the U.S. who has visited a doctor likely has signed an AOB agreement that allows the doctor's office to deal directly with the patient's insurer. The intent of AOBs has been to streamline the billing processes. However in Florida a few years back, reform advocates assert unscrupulous contractors devised a way to game the system at the expense of insurance companies and their policyholders. The problem, they say, has been growing ever since. "The first and most important impact, in our view, is that the consumers lose control of their claim," Grady said. "Assigning benefits to a third party means the vendor steps into the shoes of the policyholder and the policyholder can no longer talk to their agent or company about the claim. The policyholder is the person who paid the premium and signed the contract; they should always remain part of the claim settlement process." The abuse has led to a second impact on Florida consumers, who've seen their premiums go up, leaving insurers on the ropes. "An AOB allows a third party vendor to sue insurance companies over disputed amounts without any skin in the game," Grady said. "An AOB has allowed vendors to take advantage of the one-way attorney fee statute that was created to level the playing field between consumers and their company. Now vendors can inflate invoices, creating a dispute, and sue the insurance company without fear of having to pay any attorneys' fees. Claims frequency and severity has increased as a result of AOB abuse and in turn so have premiums to consumers." Despite the AOB abuse, state lawmakers have found reforms difficult to achieve. "There is a variety of factors but none more impactful than opposition from trial lawyers who have made a living from exploiting this loophole," Grady said.